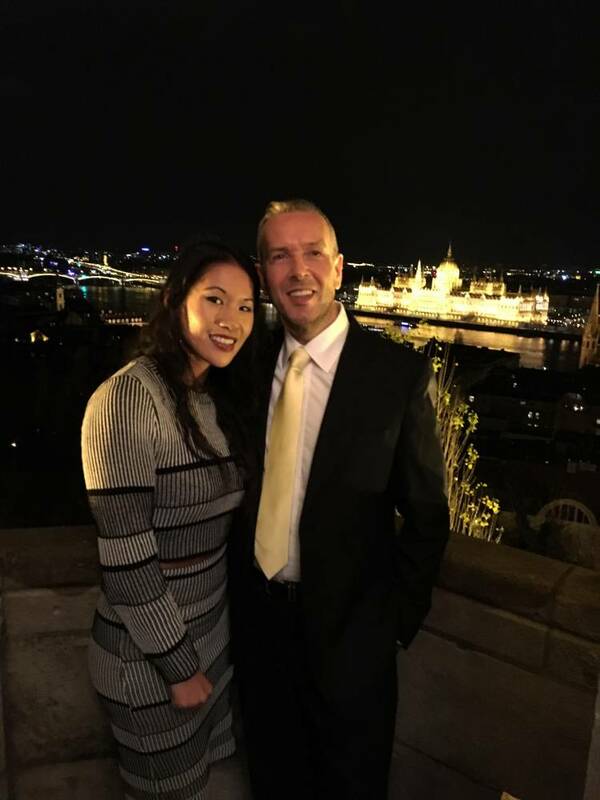 Enjoy stunning views of the Chain Bridge and the Hungarian Parliament with a romantic dinner with a view at Halászbástya Restaurant! Finding the perfect restaurant for that special occasion can be a little tricky. 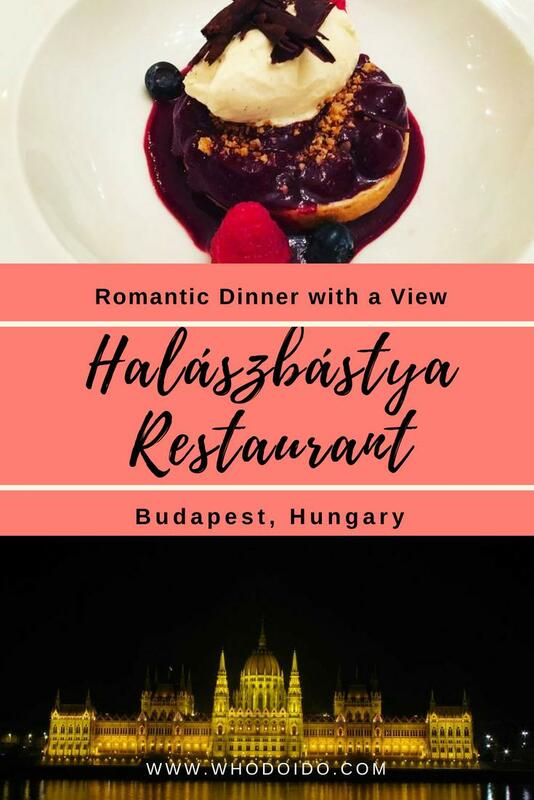 When I heard that you could dine in the Fisherman’s Bastion which includes beautiful views of Budapest at night, I knew I had to book a romantic dinner at Halászbástya Restaurant! If you’ve read our previous posts on surprises, then you’ll know we’re all about the romance! 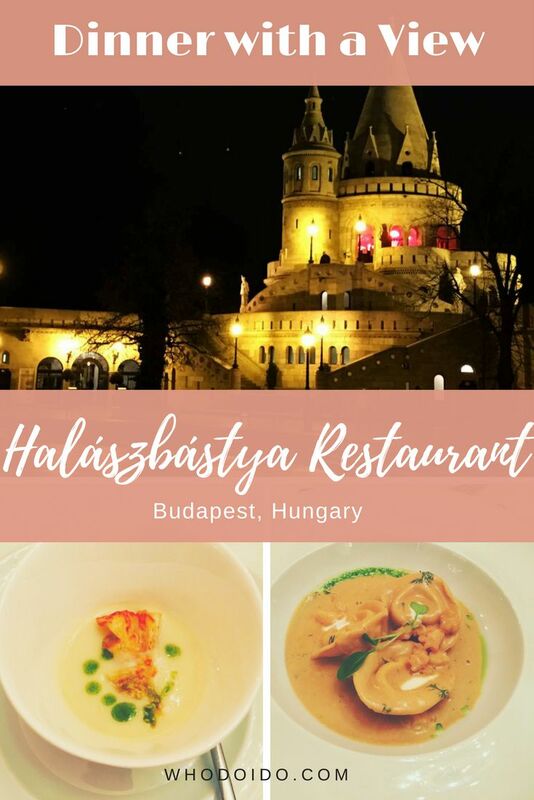 The Halászbástya Restaurant is located in the beautiful district of Buda Castle Hill. 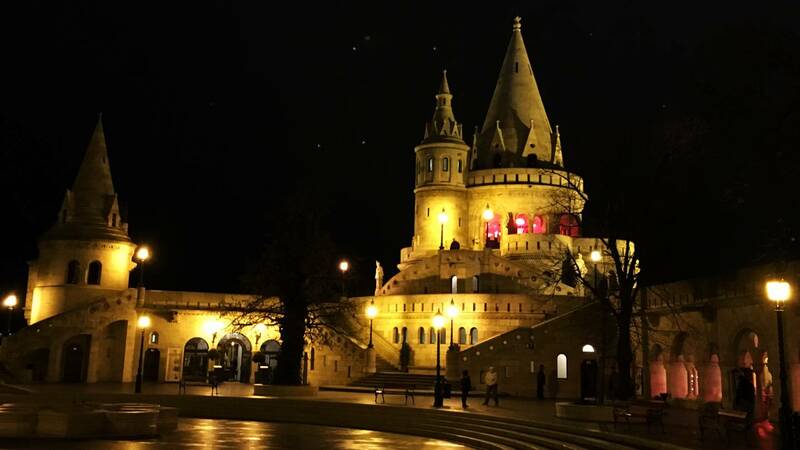 If you’re staying on the Pest side, you’ll be able to see the lookout towers of the Fisherman’s Bastion across the River Danube. 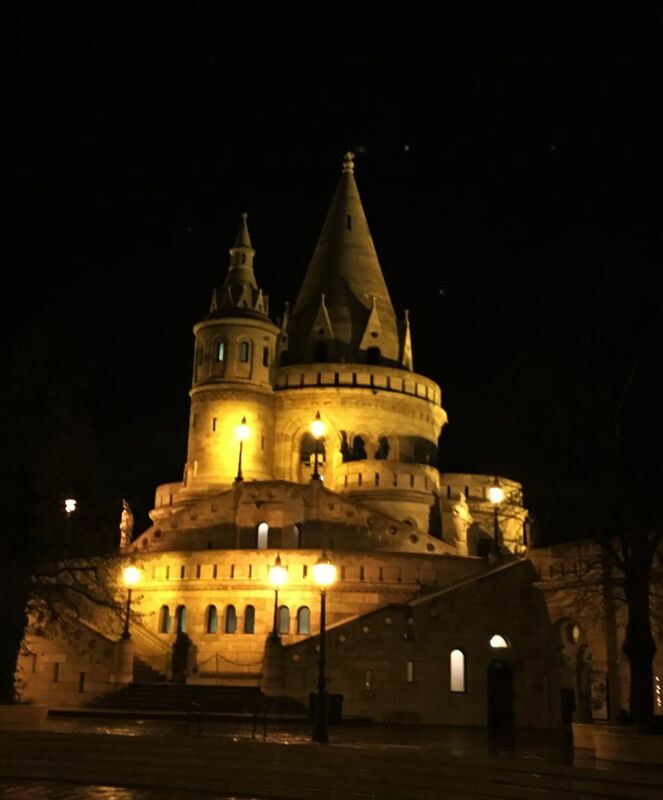 The Fishermen’s Bastion is one of the top sights to see when visiting Budapest. 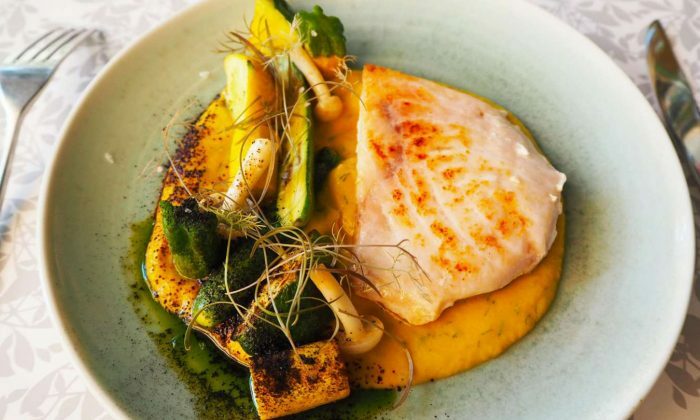 Halászbástya means Fishermen’s Bastion in Hungarian and offers incredible views of the Pest side with the kitchen creating modern Hungarian cuisine using innovative flavours. From our hotel, we ordered a taxi which saved us time and to prevent me arriving late for our reservation! 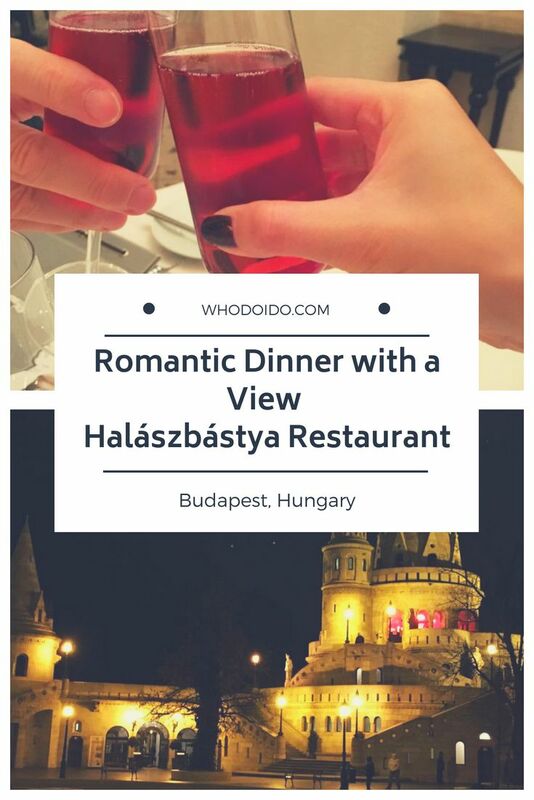 I would definitely recommend booking a romantic dinner at Halászbástya Restaurant, since you’ll be able to enjoy the pretty views of the Chain Bridge and of the Fisherman’s Bastion at night. 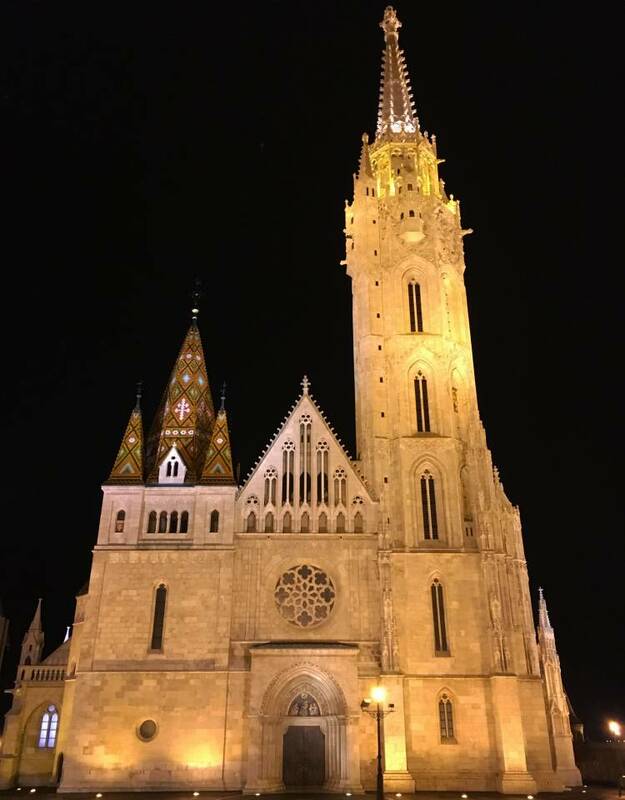 The main entrance for the restaurant is just behind Matthias Church, which is beautifully lit at night offering a great photo opportunity. Walking through the stone arches we were greeted by the friendly staff and led to our table on the second floor. 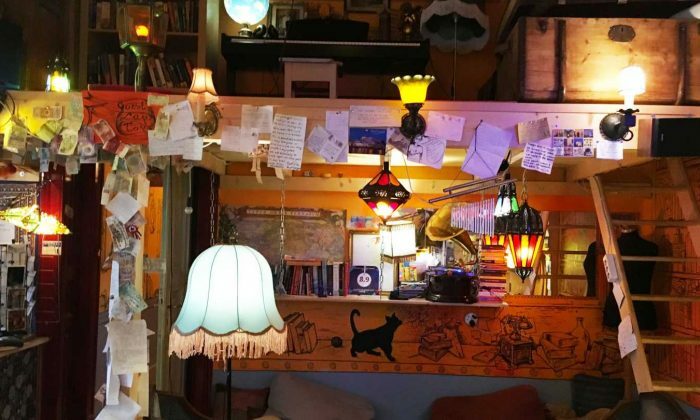 There were a few tables, just for two, well spaced out and offering an intimate and romantic setting. Each table for two was nestled in the alcove to ensure that extra bit of privacy. It was such a romantic setting with the sound of the cello and violin playing softly in the background. Celebrating Ian’s birthday at Halászbástya Restaurant. What a view from our table! We had the perfect table … as we turned our head to the left and what did we see. 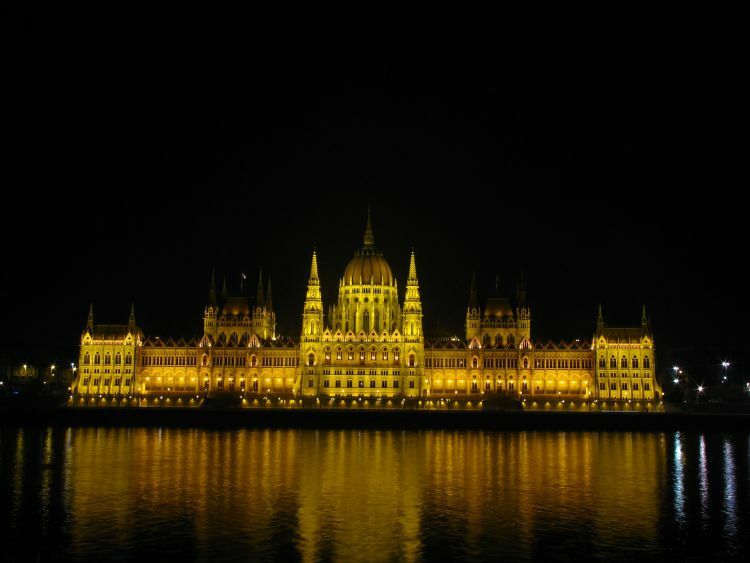 The Hungarian Parliament all lit up and twinkling away. Wow what a view indeed! 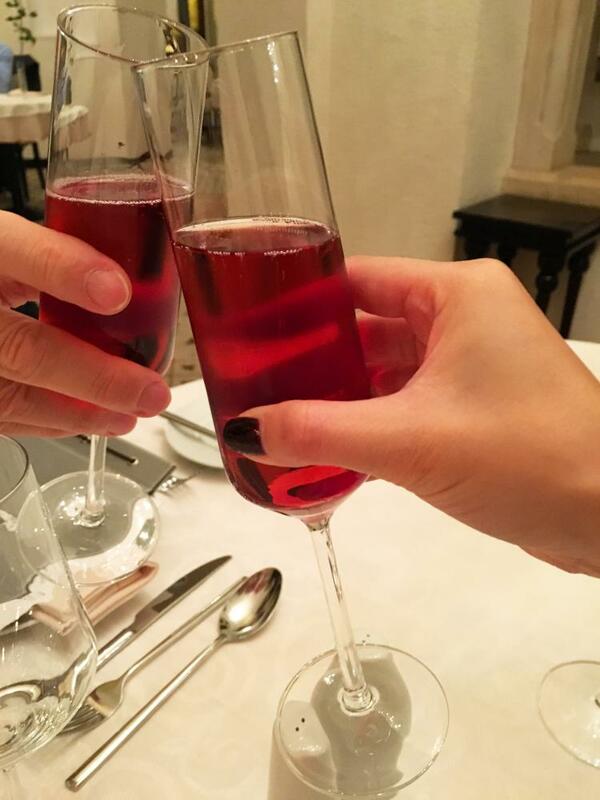 We ordered a Kir Royal champagne cocktail to sip on whilst browsing the menu selection. Whilst waiting for our food to arrive, I couldn’t help myself but to peer over to see what was happening down below. There was live music from a gypsy band and the main table was occupied by a large party. This is the Knight Hall with the round table being the main feature and the smaller tables dotted around the sides of the room. The restaurant was decorated so elegantly with a large crystal chandelier hanging from the ceiling directly over the round table. I couldn’t help but notice the terrace door by our table so I wandered over and opened it. As Ian and I stepped outside on to the terrace we were mesmerised by the magnificent view across the river. Beautiful panoramic views of Budapest at night! The waiter was more than happy to take a few photos of us outside with the Hungarian Parliament in the background. Standing on the terrace with the Hungarian Parliament in the background. A romantic dinner with a view! 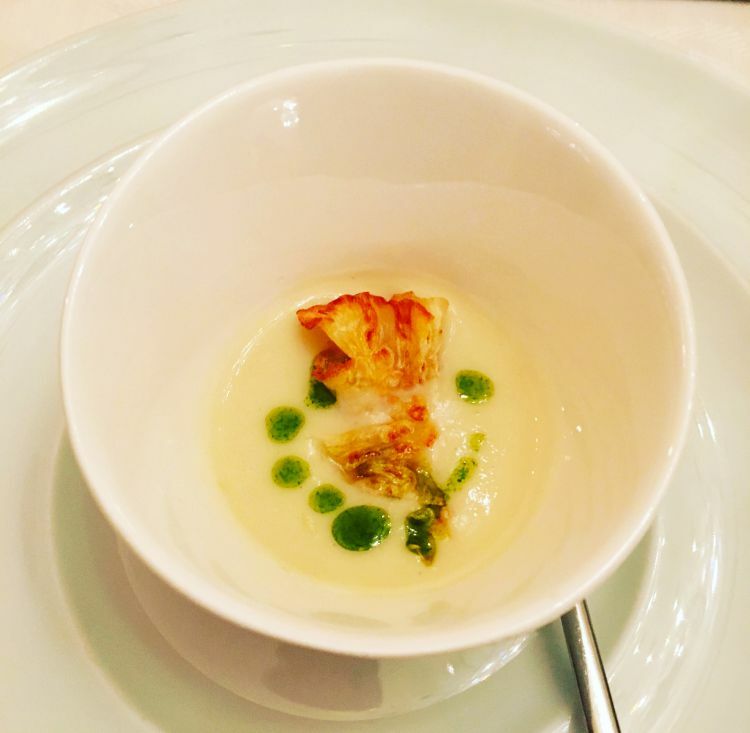 As a precursor to our starter an amuse bouche of artichoke and celery chips was served. Oooh this was so delicious, and made me want even more. Our starters came out and were served under shiny silver cloches. Don’t you just love the element of surprise. For starters, Ian chose the foie gras paté. Ooh we both so love foie gras. 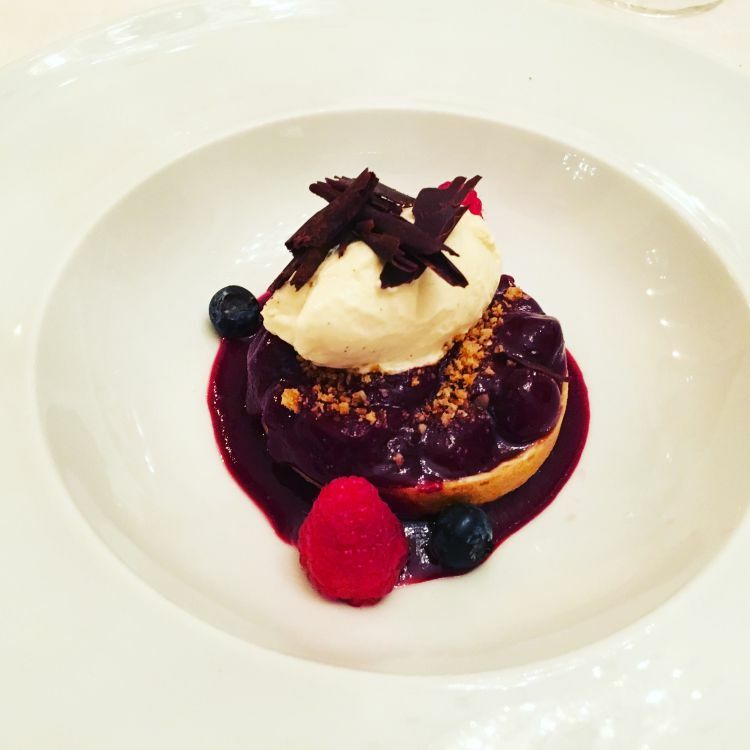 The slices of foie gras paté were lovely and smooth and accompanied with crispy ginger bread, decorated with redcurrants and blueberries. 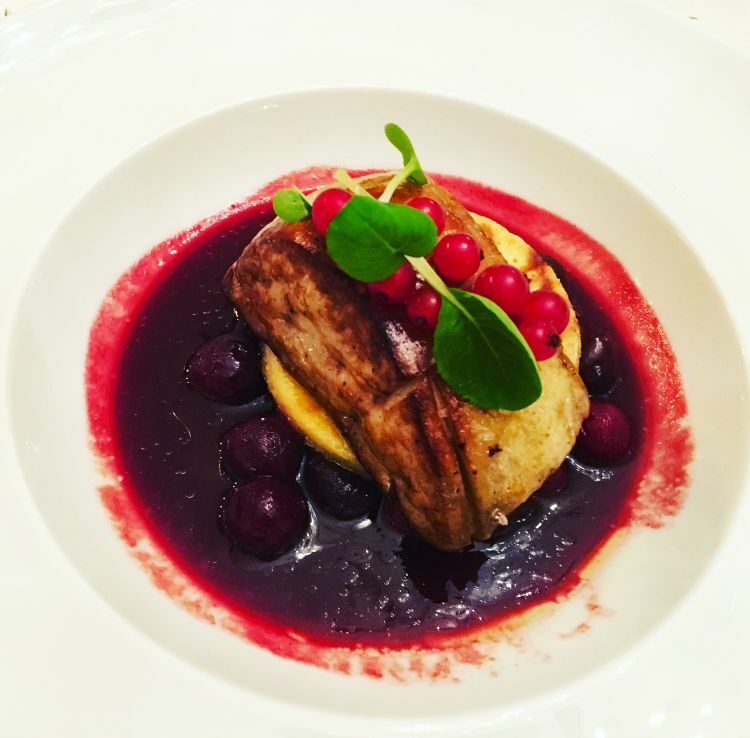 The little redcurrants definitely hepled cut through the richness of the foie gras. Ooh a cloche! I wonder what’s underneath! 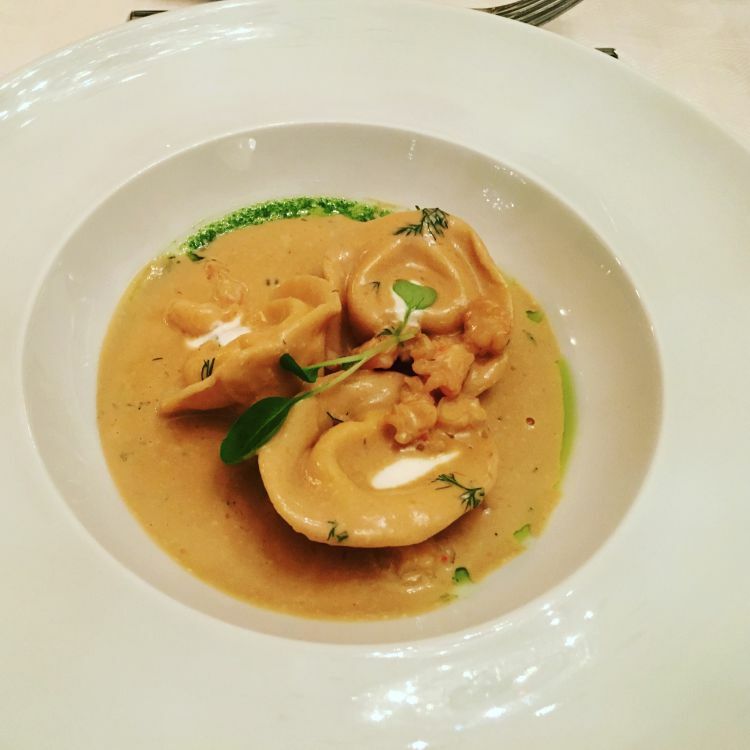 I decided to go for the unusual starter of catfish ravioli. I love ravioli and had tasted catfish before in Jackson Hole, so I thought this would be an interesting dish to try. Might as well live life dangerously hey! 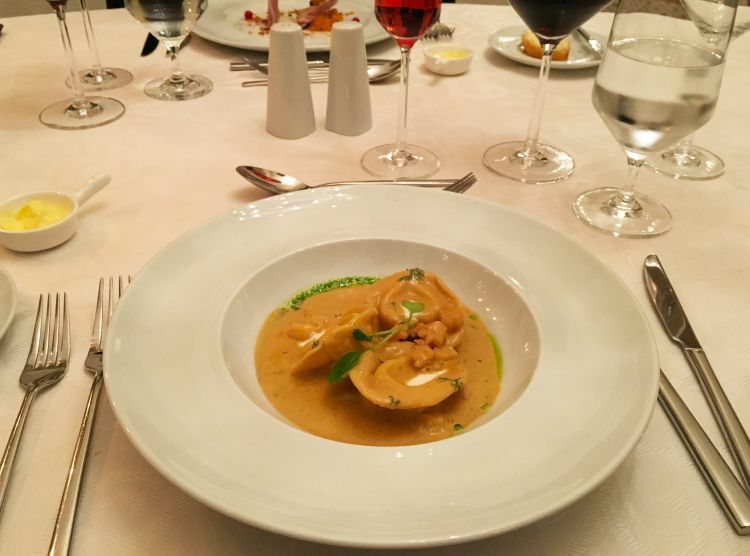 Well, what can I say … the ravioli was perfect with a creamy crayfish sauce and just a hint of dill. The crayfish was light and tender and wasn’t overpowered at all by the creamy crayfish sauce. Both starters were of a good size and set our taste buds tingling for the next course. Next were our main courses. Ian opted for the dry aged beef steak which came out the perfect vibrant pink colour just the way he likes his steaks. 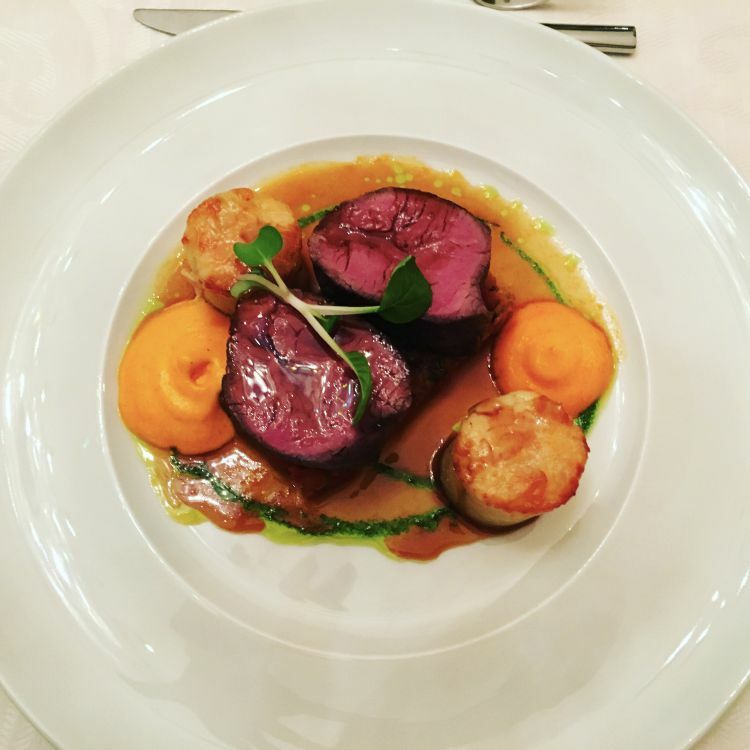 The steak was served with creamy potato gratin and letcho foam. The only niggle was that Ian found the steak a bit of gristly, which was a little disappointing as Ian was so looking forward to having one. Some parts were just too chewy. Aside from the beef, the flavours were fragrant and fully complimented the beef. Now duck liver may not be to everyone’s taste. But my duck liver dish was wonderful! 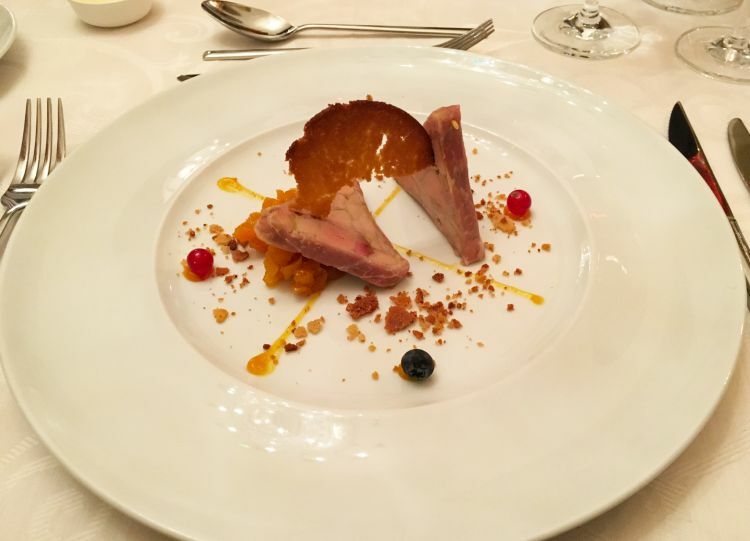 A generous portion of duck liver was placed on top of an orange flavoured blini surrounded by a rich anise and madeira sauce. The duck liver was cooked well and the sauce had the perfect balance of sweetness and richness. 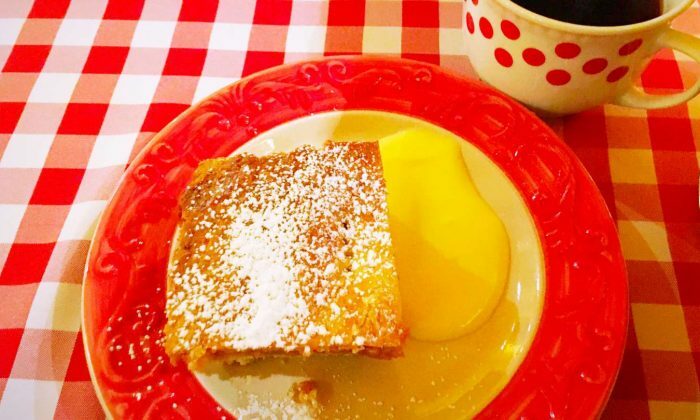 After two courses, you’d think we couldn’t possibly have dessert. Well, we managed to find room for the last course. Both of us chose the cherry pie with vanilla ice cream. If you’re a fan of cherries then you must order this. Sour cherries toppled over a soft sponge base with a generous dollop of creamy vanilla ice cream. Sour cherries and ice cream are a match made in heaven. This dessert was just heavenly! As we relaxed into the back of our chairs digesting our food, the live band were making their way round playing a selection of music and willing to take requests. Since it was Ian’s birthday we had to have them play happy birthday! There was also an opportunity to purchase the band’s CD if you enjoyed their music. During the Summer, take the stairway to access the terrace and enjoy drinks with views of the Budapest Parliament and the dome of the Basilica. For 360 panoramic views, guests can enjoy an exclusive dining experience up in the Tower Room. We had Ian’s main course removed from the bill due to the beef being a bit too chewy and the manager was very sincere and apologetic. 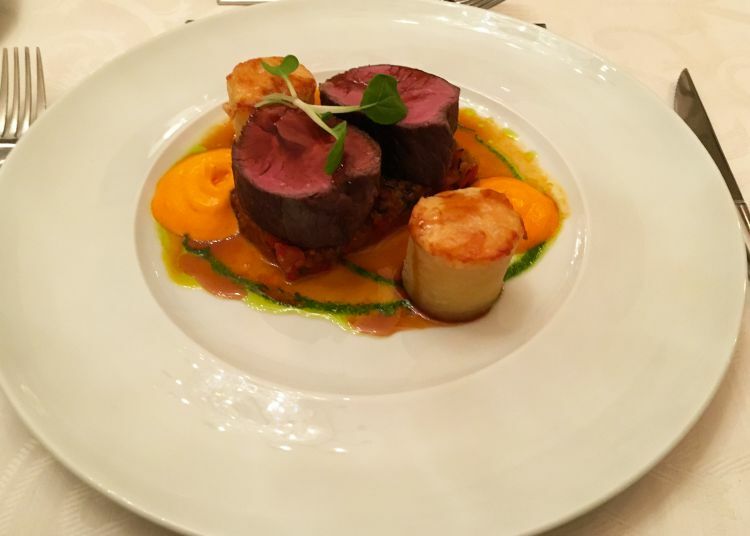 The food was well presented, flavoursome and of a generous portion size. 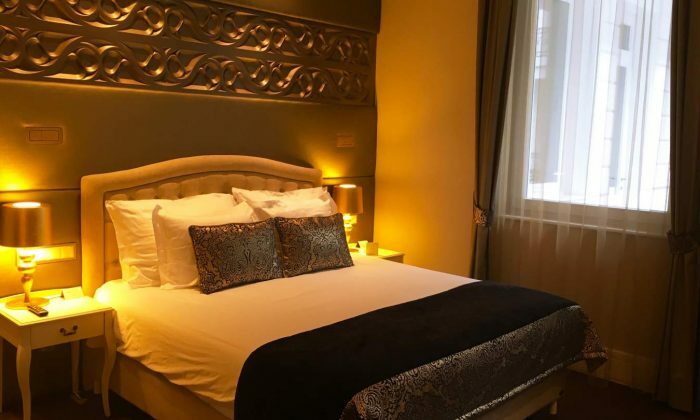 The service was attentive, not pushy and the staff were polite and friendly. If you’re looking to surprise a loved one or celebrate a special occasion, then we recommend reserving a table here. 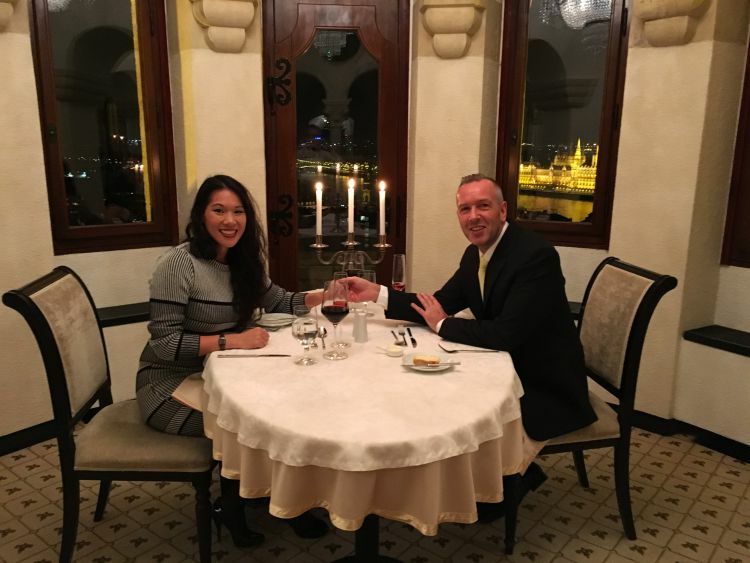 You can’t beat a romantic dinner with spectacular views of Budapest at Halászbástya Restaurant. Truly a fairytale and romantic setting making this a memorable experience. 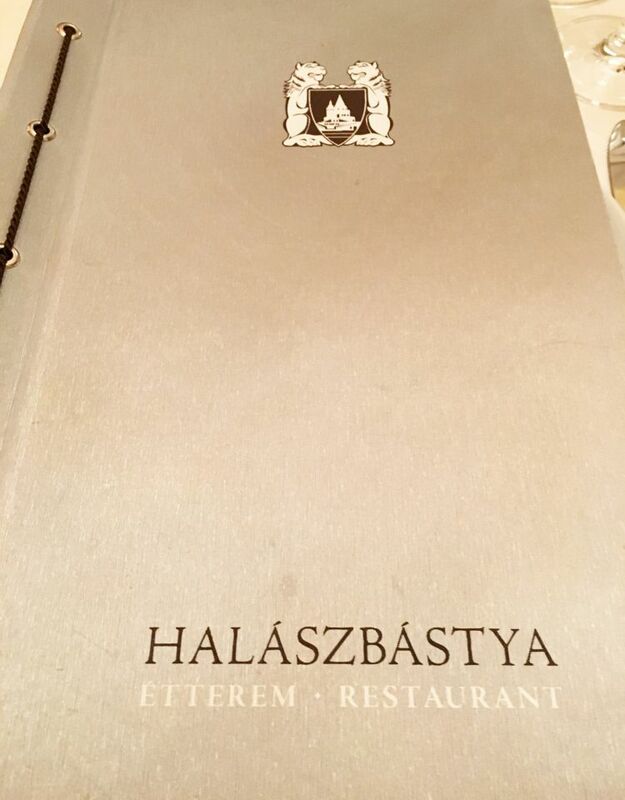 Have you dined at Halászbástya Restaurant? Which restaurant would you recommend for a romantic meal with a view? This looks very romantic! The food is making me hungry! Thank you for sharing your night!! what a wonderful trip! 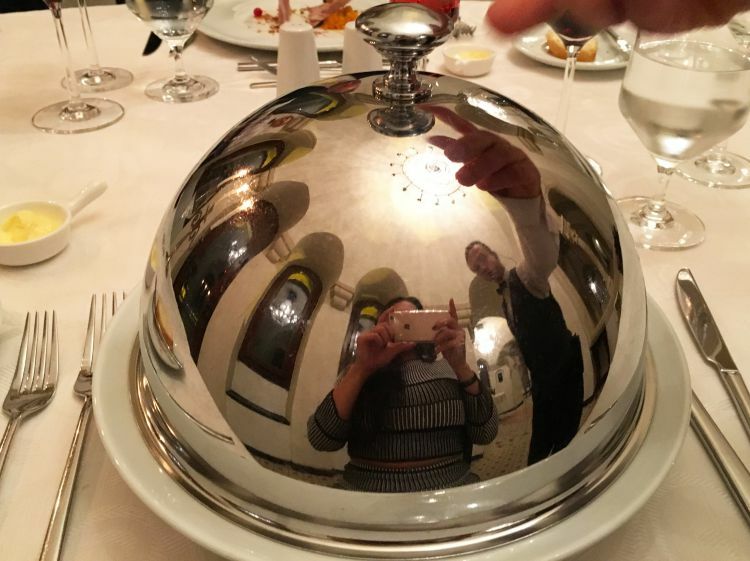 Love the food pics!! Oh wow! 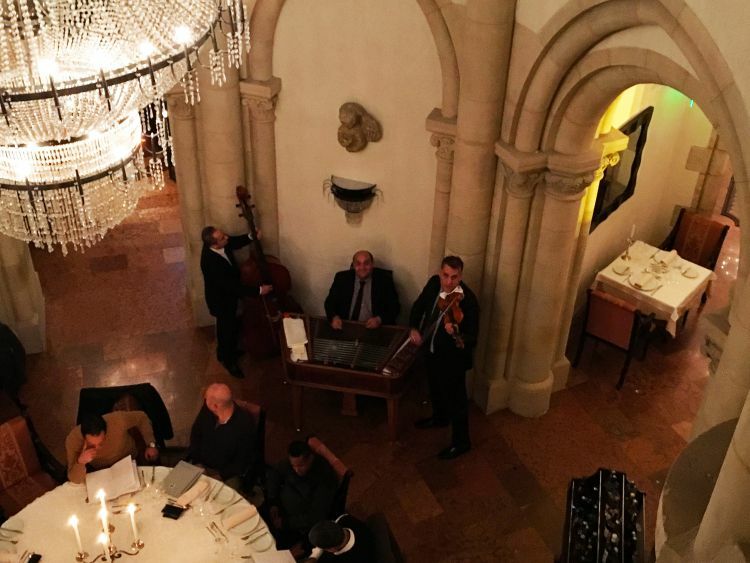 This looks like the most romantic restaurant in Budapest. The food looks yummy too! Really want to go to Budapest, definitely eating here when we go!! Looks so amazing and what a view! All of that food looks so delicious! And the views are so amazing, it looks like an amazing place to have a nice dinner with a significant other. The live music is a nice added plus as well. I’m a little disappointed that the steak wasn’t that great especially since the pieces were so small, but it looks like the other food was good so hopefully that made up for it. One of my dream destination is Budapest and just by looking at your photos makes me want to book a plane ticket now. Oh I wish it is just easy to go there. I love how they plated each dish to look oh so presentable. I bet it is as delicious as how it looks. Have yet to visit Budapest but it looks like such a beautiful city. I would definitely eat at Halászbástya Restaurant just for the view! What a view! 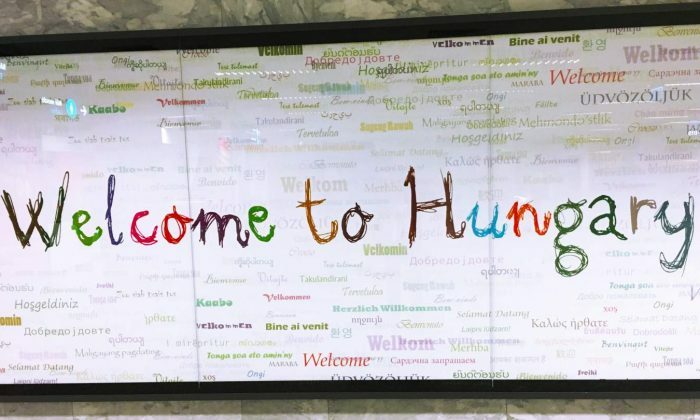 I saw this restaurant when I was in Hungary last but didn’t go in. I totally wish I did now. The food looks delish! That food looks so delicious. And what a superb location. How lucky to have such a beautiful view and such a romantic dinner. Thanks! A great way to capture the views at night! Oh that looks amazing! I’ve been to Budapest before but had no idea that restaurant was there, I certainly didn’t eat anywhere with such an amazing view! I’ll have to check it out if we visit again.